10.5" x 13.25" x 1.25"
Yes - several breweries used this tray. 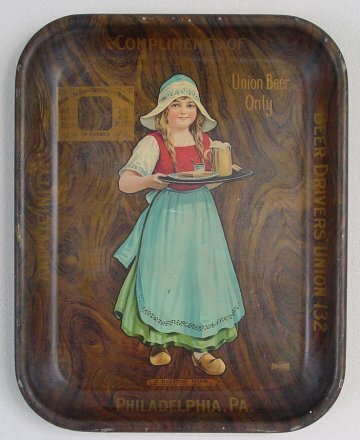 Philadelphia, Pennsylvania Comments: It appears the Philly Beer Driver's Union 132 got on the band wagon of making trays. I wonder if they handed them out to their members or customers or both? If you have more information, please drop me an email. What is this little girl doing serving Beer anyhow and does she have a brother? Press here to find the Answer!